They may be good for the environment, but photovoltaic solar panels are not really something you’d go out of your way to visit and admire. So in a bid to make solar power more appealing to young people, one Chinese company has ditched the traditional approach of filling fields with uninspiring rows of PV panels, instead building its solar plants in the shape of giant pandas. The above image is an artist’s impression of Hong Kong-based Panda Green Energy Group's first panda solar plant, which began generating electricity in June. The reality, so far at least , is a little different. Located in China’s northern Shanxi province, the Datong Panda Power Plant is a giant 50MW solar array spread across 100 hectares. It is the first plant to be built under a scheme agreed by the United Nations Development Program (UNDP) and Panda Green Energy’s major shareholder, China Merchants New Energy. As well as building Panda-shaped solar plants, the UNDP agreement also supports three initiatives aimed at promoting green energy among young Chinese. These are: an Open Design Challenge encouraging young people to design solutions for sustainable development; summer camps at the Datong panda plant focusses on innovation in science and technology; and a Youth Exchange programme helping “marginalized” Chinese youths to go overseas. Some might question whether China really needs to invest in promoting solar power at all: it is by some distance the world leader when it comes both the manufacture and installation of PV panels. 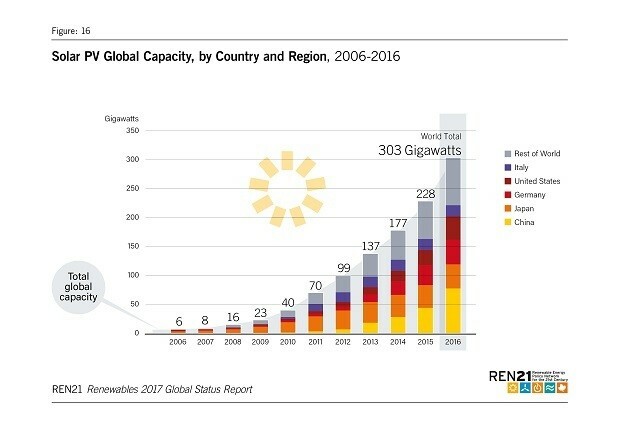 According to data published by REN21 , at the end of 2016 China had 77.4GW of solar PV installed, representing more than a quarter of the global total. China also dominates when it comes to building new solar PV plants, adding 34.5GW last year. This accounted for 46% of all new solar power plants across the planet in 2016. While a second 50MW Panda power plant is planned for Datong, Panda Green Energy Group’s mission to promote green energy includes an ambition to expand into other countries. Earlier this year the Prime Minister of Fiji, Josaia Voreqe Bainimarama, said he hoped the planned construction of a panda power plant on the South Pacific island would start soon . While Panda Green Energy Group’s solar power plants are striking, they are not the first PV installations to attempt to represent animals with silicon panels. US utility Duke Energy last year revealed its 5MW Reedy Creek solar plant in Florida had taken the form of Mickey Mouse. The facility comprises 48,000 solar panels occupying 9 hectares near Walt Disney World Resort, helping to meet the electricity needs of the theme park and nearby hotels. The Mickey Mouse solar plant began operating in what was a record year for solar PV installations in the US. According to renewable energy group REN21 , for the first time ever, solar PV represented the country’s leading source of new generating capacity. More than 14.8 GW of capacity – almost double the installations in 2015 – was brought online in 2016, representing a fifth of all solar PV capacity installed globally. At the end of 2016, the total installed solar PV capacity in the US was 40.9 GW, putting it ahead of Japan and Germany in REN21’s ranking of solar superpowers, but a distant second to China.